I went to google and began typing it in; "A container of ashes might one day...." and noticed that the top row was anticipating the quote so I clkd on 'Feeling lucky' and was delivered to this site . A very interesting collection of work from primarily one interesting person. I went on to read one piece about The Byron Bay Vision and learned that the author had been deeply affected by an experience in Byron Bay in 1998. He doesn't say what hallucinogen he had taken although he did refer to cane toads and the hallucinogen in their skin but from the description of his experience I am certain it was psilocybin from gold top and/or blue meenie mushrooms. "This is a photograph of the small room I stayed in while in Byron bay. It was while lying on the floor here, that I would have a powerful mystical experience and receive a vivid metaphysical insight. 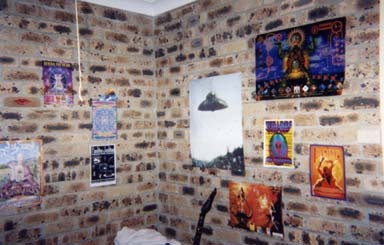 During my stay in Byron bay I would spend a fair amount of time here, playing guitar, staring at the wall and ceiling. All the while during this time I really felt borderline insane. My head wasn't feeling right at all. Perhaps there is some truth in the idea that certain types of 'energy' are concentrated at specific points on the Earth, and that these 'energies' may affect some people in strange ways." These are the same hallucinogens used by the Hopi Indians which takes us back to where it began. It's too neat to ignore and Wai Tsang is too interesting to ignore. His primary field of work is Artificial Intelligence it would seem there is a lot more to him than that.